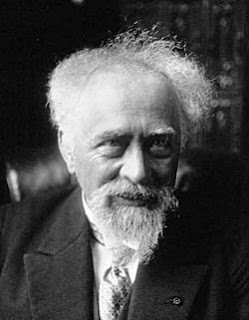 Jean Baptiste Perrin was born on September 30, 1870 in Lille, France. He attended Ecole Normale Superieure in Lille and worked there as a physics assistant from 1894 to 1897. He earned his doctorate in 1897 for a thesis on cathode and x-rays. After graduation he was appointed to a readership in physical chemistry at the Sorbonne, University of Paris. He became a professor there in 1910. He served as an officer in the French Army's Engineering Corp. during the World War I and he was removed from his professorship when the Germans occupied Paris in 1940. Perrin's early work on cathode rays proved that they were made of negatively charged particles. His work covered a number of topics in physics including the effects of x-rays on the conductivity of gasses, fluorescence, and the radioactive disintegration of radium. He suggested that stars obtained their energy from the thermonuclear reactions of hydrogen. He wrote numerous books and papers including Les Atomes where he describes his studies on Brownian motion, which confirmed the atomic theory, that all matter is made of atoms. In 1905 Albert Einstein had published a paper on Brownian motion describing how it was the result of atomic theory. Brownian motion is the random motion of particles suspended in a liquid, discovered in 1827 by Robert Brown, an English botanist who watched pollen particles suspended in water. Suspended in a liquid, the particles are constantly bombarded by moving molecules of the liquid. This causes the visible particles to move in random directions. Einstein's paper was theory and it was Perrin who experimentally demonstrated that matter is made of molecules. Perrin was able to use Brownian motion to determine a value for Avagadro's constant that closely agreed with the value obtained using Dalton's law of molecular motion. Avagadro's constant is the number of molecules in a mole of a substance. For his work, proving the atomic theory Perrin was awarded the 1926 Nobel Prize for Physics. Perrin was the recipient of numerous other awards, including the Joule Prize from the Royal Society in 1896 and the La Caze Prize from the Paris Academy of Sciences in 1914. He was made a commander in the French Legion of Honor in 1926 and a commander in the Legion of Leopold (Belgium). He was awarded numerous honorary doctorates. In 1940 he fled German occupied France to the United States where he died on April 17, 1942. After World War II, in 1948, his remains were returned to France aboard the light cruiser Jeanne d'Arc and he was buried in the Pantheon in Paris, France.